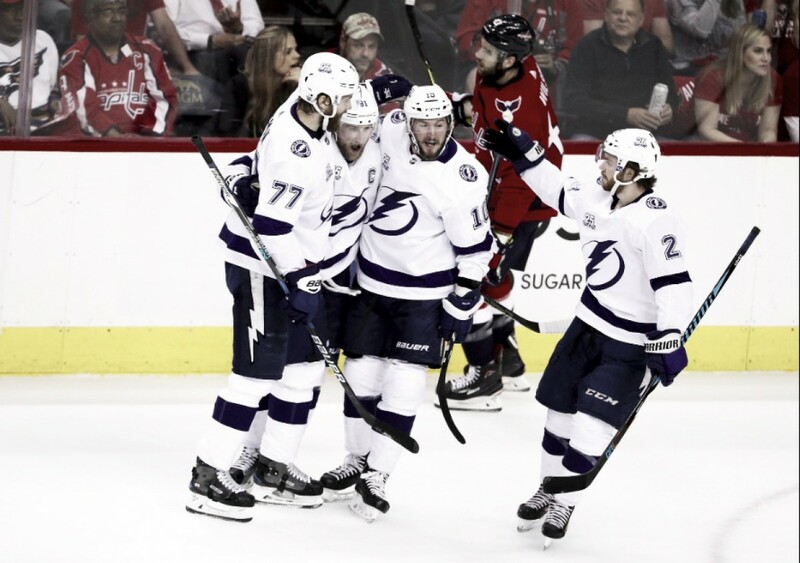 The Tampa Bay Lightning showed that they will not be pushed around as they win 4-2, making the series 2-1 in favor of the Capitals. 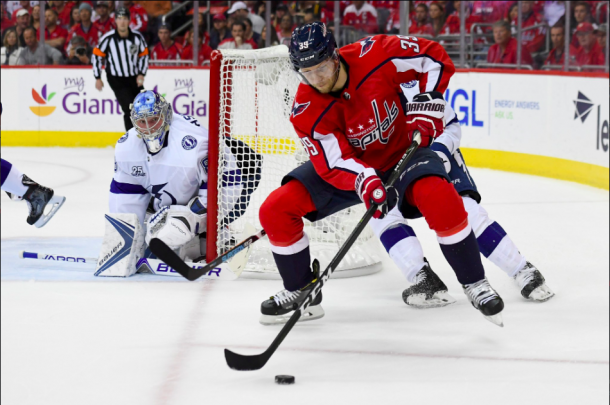 The Washington Capitals looked to punish the Tampa Bay Lightning at home to take a 3-0 series lead, and dig the hole deeper for the Bolts than what it already was. Both teams created chances early, making sure to work the other team's goaltenders. Washington got their first golden opportunity nine minutes into the first after Anton Stralman was whistled for a boarding penalty, sending the Caps to the power play for the first time in the game. Nothing would come of it, but then the Caps would be on the kill minutes later after Braden Holtby was whistled for a tripping minor on Yanni Gourde. The Bolts got on the board first, with Steven Stamkos slapping home a pass over the left shoulder of Holtby, giving Tampa Bay a 1-0 lead. With that power play goal, Stamkos (10 playoff series PPG's) tied Martin St. Louis for most power play goals in a Lightning playoff series. He also passed St. Louis to become Tampa Bay's all-time leading playoff power play scorer with 25 points. The Lightning had all the momentum going in their favor as the first period came to an end with the road team leading 1-0 and Stamkos the lone goal scorer in the opening frame. The weather in the D.C. area called for storms. And of course in storms, comes lightning. Not only did it strike outside, but it struck again inside with Nikita Kucherov doubling the Bolts lead to 2-0 with a power-play goal over the left shoulder of Holtby, similar to the Stamkos goal. One minute and 47 seconds later, Victor Hedman got his name on the scoresheet with a goal on a wide open net with the help from Kucherov setting him up. Brett Conolly pulled one back for the Caps after the Bolts failed to clear the puck thoroughly, allowing Conolly to get a one-time shot past Andrei Vasilevskiy making the score 3-1. Brayden Point restored the three-goal lead with a little over two minutes left in the second period. The Bolts looked to be alive and well, carrying a three-goal lead heading into the second intermission. The Bolts had a great opportunity about midway through the final period when they were on a 4-on-3 powerplay. Washington did an excellent job of clearing the puck, and not letting Tampa Bay get a good chance on goal... or a good shot at that. Evgeny Kuznetsov got a second for the Capitals after T.J. Oshie set him up perfectly for a shot that found the back of the net. The Tampa Bay Lightning saw this game out, winning 4-2 on the road cutting the Caps' series lead in half to stay alive. Game 4 is Thursday night at 8 pm EST. We don't know the weather forecast just yet, but the Lightning are hoping for a repeat storm in Washington D.C. so they can tie this series and get it even again. Were you expecting the Washington Capitals to take a commanding 3-0 lead, or did you know that the Tampa Bay Lightning would come back to take Game 3? Let us know in the comments section below.